Last weekend my friend Paul proposed to his girlfriend, Ashley. His plan was the most romantic, elaborate story I have heard. Being that it involved so many people and businesses in Orange Country (Newport Beach, Costa Mesa, Laguna) I thought it would make an excellent article/story for your publication. One day when Ashley was a little girl she noticed a helicopter flying overhead. Later that night she watched smiling people waving at a helicopter on the news. Ever since then she has waved at every helicopter because, in her mind, someone is up there watching. Paul has always liked that story about Ashley and decided to include that element into his proposal scheme. With Paul’s birthday being the day before, he setup a lunch date with two of their friends. Once Ashley had arrived at the Newport Beach Hyatt, he called to say he was running late and would be there shortly. As they were waiting around on the golf course for Paul to arrive, a helicopter flew over. Right on cue, Ashley waved to the helicopter. The helicopter proceeds to land on the 6th hole where they are standing and Paul gets out! He then proposed to her, and asks her to get in the helicopter with him. Meanwhile, friends and family of Paul and Ashley walked up and down the beach at Corona Del Mar passing out flyers asking people to wave when the helicopter would fly by. The goal was to get Ashley to see what it looked like from the helicopter’s perspective when people wave. I guess it must have been hundreds of people waving at them! 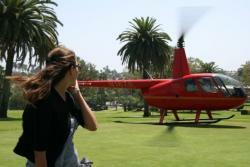 After the helicopter ride they went to The Montage in Laguna Beach for a special spa treatment for Ashley. Paul had secretly set Ashley up to go shopping with her mom for a special dress that she could wear when Paul proposed (she assumed that she would have the proposal all figured out and had bought the dress thinking she would keep it a secret from him). Paul had her whole outfit ready for her at The Spa Montage so that when she got done with her massage it was all set up and ready for her. After experiencing the most exceptional spa treatment they have ever experienced, they had a romantic dinner at the Studio, a restaurant at The Montage. After what Ashley describes as the best day of her life, Paul tops it all off with her opening her apartment door to find the entire place filled with her favorite flowers.